Jam made from scratch is the perfect way to preserve the taste of summer, not to mention the perfect holiday gift throughout the year. 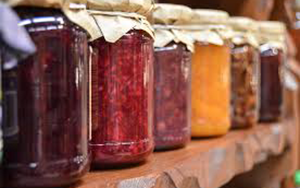 In this class Carolyn will show you how to sterilize equipment, prepare your fruit, and safely seal your jars, all in the comfort of our spacious classroom. You'll wrap up the workshop by applying decorative paper finishing. In-season fruit, white sugar, jars, and equipment provided.